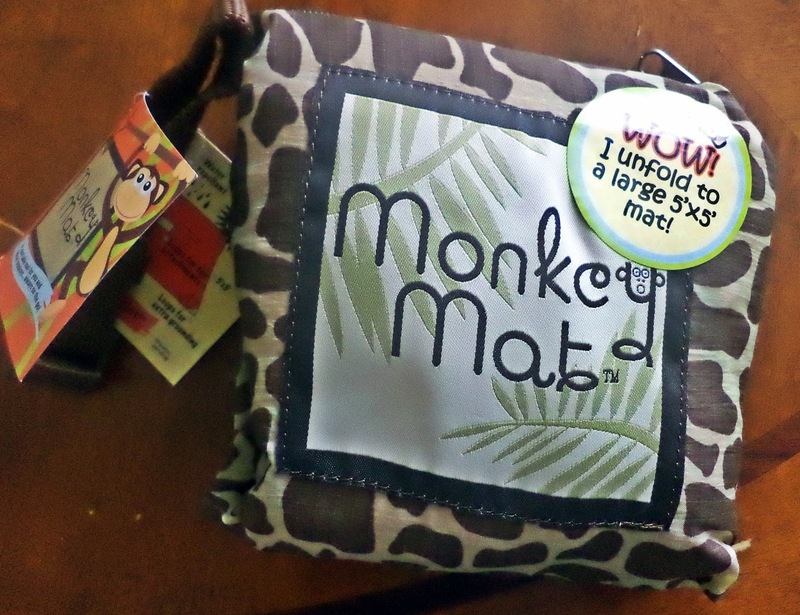 Mama Love: Monkey Mat Review! A desperate desire arose for either a constant shower of sanitizer…or a portable, clean surface I could take EVERYwhere. Not a bulky blanket (who has room? ), or something I had to plan for in advance to have with me (I am just NOT that organized!!). And so began the search for a portable, clean surface to take EVERYwhere. And so the Monkey Mat® madness began!.. I Was Recently Sent a Monkey Mat and I’m in Love with it! 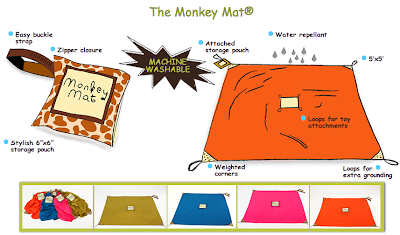 For those of you who didn’t quite get what the Monkey Mat is by the descriptions above; the Monkey Mat is a very convenient and Versatile product to have for anyone with children who travel places with their kids, short or long distance (actual airport traveling or just around town outings). The quality of the fabric is great, fashionable and durable, I feel like this mat will last us for a long time!!! First off I love How Compact and Lightweight It Is. When I say Compact I Mean Compact When Folded Nicely in The Included (And ATTACHED Pouch that it comes in). When Fully Spread Out (5’x5’) It Is quite Large. The Monkey Mat Also had a Neat Clip attached to the Pouch for Even Easier Convenience, I can clip the Small Pouch to my diaper bag, stroller, purse, or Whatever and that’s it: It doesn’t take up extra space In my bag! Also, like this product could really get any better, it's a water repellent, machine washable, weighted corners (so that it doesn't get moved around), has Loops in the center to clip toys on, and loops on the corners in case you want to add some extra securing when you're on grass!! Oh and comes in several colors! Truly they have thought of everything with this product!! 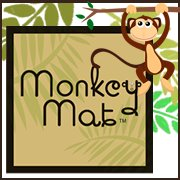 We have had our Monkey Mat for Less than a Week and Have already used it several times, and have plans to use it A lot More! We took it with us to Soccer, and it was perfect for my girls to sit on while cheering on their brother, also the girls have used it for several teddy bear “tea party/ Picnics”! 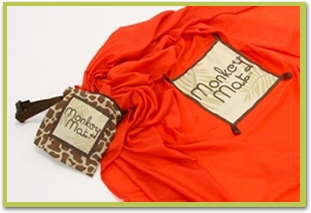 I Plan on Keeping this in the Car at all times to have on hand for Picnics, Sporting events, Playdates, and whatever else we may need it for; I know The Monkey Mat will be a lifesaver this Summer!! 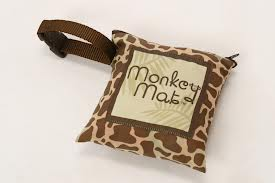 This is an awesome product and I would highly recommend it to any parents who have little ones!